SoCal Smiles Dentistry can lay the foundation for a lifetime of good dental health and habits for your children. Dr. Scott Karafin and his staff have the compassionate approach to successfully treat even the youngest members of your family. From our kid-friendly waiting room to a prize at the end of the visit, we know how to make your child feel completely comfortable during their time with us. 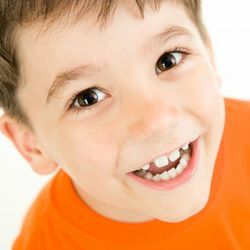 Protect your child’s smile and oral health with pediatric dentistry at our Rancho Santa Margarita, CA, practice. Contact us today to learn more or schedule your child’s appointment. Our team has extensive experience providing dental care for children, and we warmly welcome young patients. We have the tender approach to care that will help your child relax in the exam chair, as well as spark excitement about good dental health and at-home care. Our friendly staff knows how to speak with your child in a way that engages them during exams and treatment, while putting them at ease. With our gentle manner and enthusiasm, your child can forge a positive relationship with the dentist that lasts a lifetime. Parents can bring children as young as three years of age to our office for dental exams. These short visits are designed to be simple introductions to professional check-ups and what dental health professionals do. After your child is acquainted with the office, we will go to a treatment room for a ride in the dental chair. As the examination begins, we will make sure that your child is completely relaxed and does not have any unaddressed worries. We will encourage you to hold your child during treatment, and we will work closely with you to create a general atmosphere of support and trust. This cooperative effort makes initial dental appointments more comfortable, and also serves a very important role in setting the stage for sound oral health into adulthood. These pediatric check-ups not only get your child acclimated to the dental office, but the exams also help us to identify any potential health problems that may develop in the future. Early intervention of oral health conditions ensures that treatment has a greater chance of success. Your child’s first dental exams are also a great opportunity to review at-home practices. We can provide instruction on proper brushing and flossing techniques, all while explaining the importance of good daily oral hygiene. Lastly, as our young patients leave our office they can choose a prize from the treasure chest to take home. Your toddler’s examination will be shorter than an exam for an adult or older child. Simple, quick, and painless, an early childhood check-up is an important first step towards a lifetime of healthy smiles. At Archway Smiles Dental, we strongly believe that a positive dental experience early on can encourage great oral health for years to come. Contact us today to set up an appointment. We look forward to meeting you and your loved ones!